A few years ago, if you had told me that my son would be interested in helping out in the kitchen and cooking with me, I would have been skeptical. He wasn't one of those kids who jumped at the chance to get his hands dirty in the kitchen. But I have to say that things have changed quite a bit. Wanting to share one of my interests with him, I've been luring him into the kitchen, bit by bit, in the last couple of years. And now, having him there, helping me crack some eggs or completing a whole recipe together, is not uncommon. He might not have a big passion for cooking or baking but I think he's figured out that working/playing in the kitchen can be a lot of fun. I like to think that he learns a little something in the process when we make something together, and I know he appreciates the sense of accomplishment and the tasty reward at the end! So this summer, I made a goal. I wanted to get the little guy in the kitchen for a few cooking "sessions". Beyond one-off projects or just stepping in to help me whisk something or to spread a batter here and there, I wanted to teach him how to make a few simple dishes from beginning to end. We get to spend time together (cooking and eating) and longer-term, I hope that by cooking more and more, he'll be able to make basic meals for himself down the line as an adult. Well, the summer flew by fast. 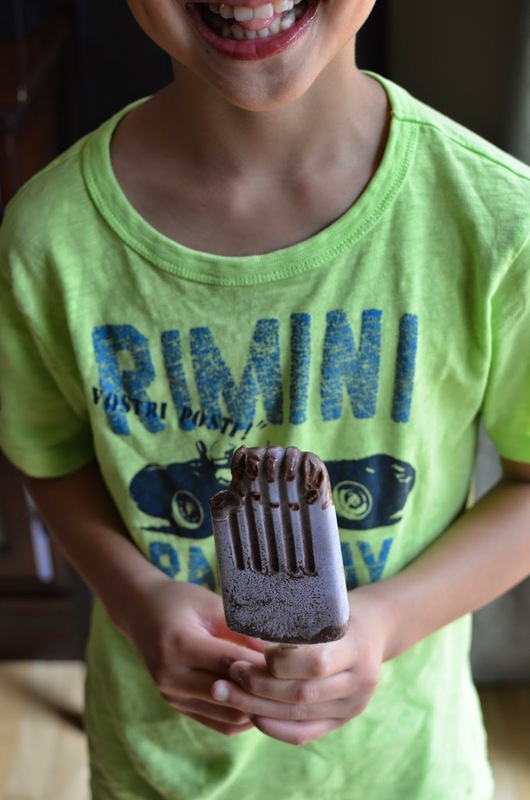 It can be hard to carve out time for "cooking lessons" but we managed when I look back at it. 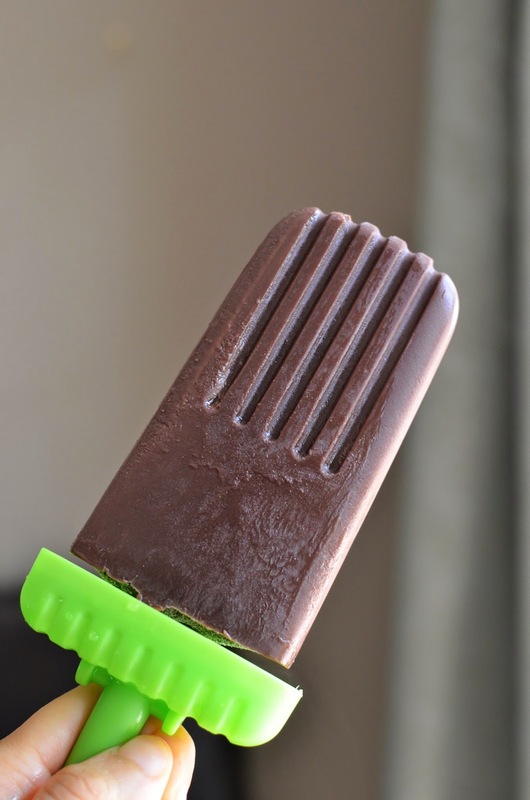 As I've posted before, we were in the kitchen making fun things like pudding pops and grilled chocolate sandwiches but we also collaborated on a few others, including some savory dishes. The trick was finding easy and relatively quick dishes that the little one would enjoy because then there'd be motivation to keep going. I think we did all right since he was a big fan of everything he cooked up. I have Kelly at Life Made Sweeter to thank for today's tasty kitchen experiment. A week or so ago, she posted some delectable-looking toasted coconut banana bread ice cream sandwiches and I spied a recipe for coconut ice cream within it that I just had to try. 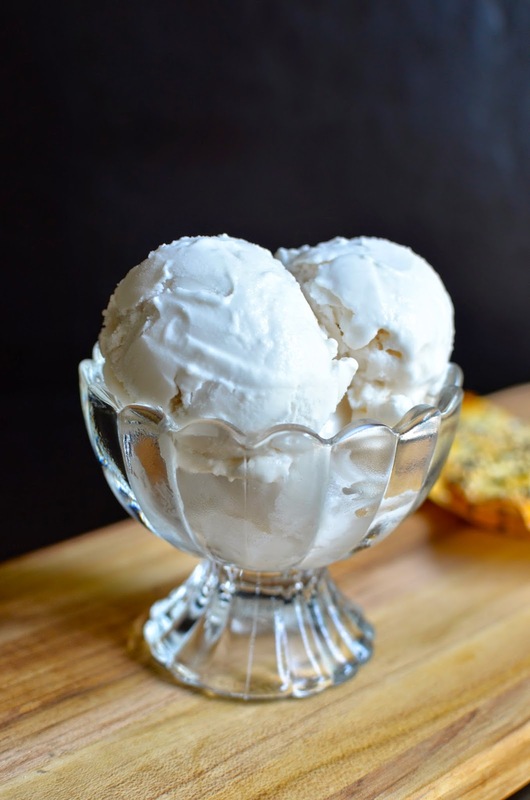 The ice cream takes 3 ingredients to make: coconut milk, sugar, and vanilla extract. Who can resist something that simple! Clearly not me because I was pulling out my little ice cream machine in no time. This may be an odd time to say that I'm actually not a huge fan of coconut...but I just love coconut milk. The aroma and taste of it is nothing short of intoxicating. While I have been getting into the habit of cooking with light coconut milk and it works really well in many cases, this is definitely not the time for it. You need to use full-fat coconut milk since you're making ice cream and want as much creamiest as possible. I went digging in my pantry and actually found a can sitting there waiting for me so it was surely meant to be. True to expectation, the finished product tasted like delicious coconut milk in ice cream form! If you love coconut milk, there's nothing not to love about the taste of this. And you'll love that it takes little more effort beyond dissolving some sugar in the coconut milk and letting it chill before churning. And in the spirit of simple and easy, I decided to whip up some sweet sesame seed wonton crisps to go with the ice cream. They are really easy to make! Take a few wonton skins, lay them on a baking sheet and brush them with a little egg wash before sprinkling with sesame seeds and a bit of sugar. Then bake until browned and crispy. The sesame flavor really pops in these wonton crisps and went really well with the coconut milk ice cream. The two pack a lot of flavor individually but worked well together to bring each forward. You could serve one alongside or even lay some ice cream right on top of one like I did. It's fun either way because it ends up being finger food. And when you're done, you can take your extra wonton wrappers and make a batch of savory wontons like I did! I may very well have defeated the purpose of an icebox cake by making the cookies myself. After all, the appeal of the icebox cake is its simplicity and the fact that it requires no baking. Well, what can I say...baking is what we do here. This is my first icebox cake. It's the first time I'm making and eating one. 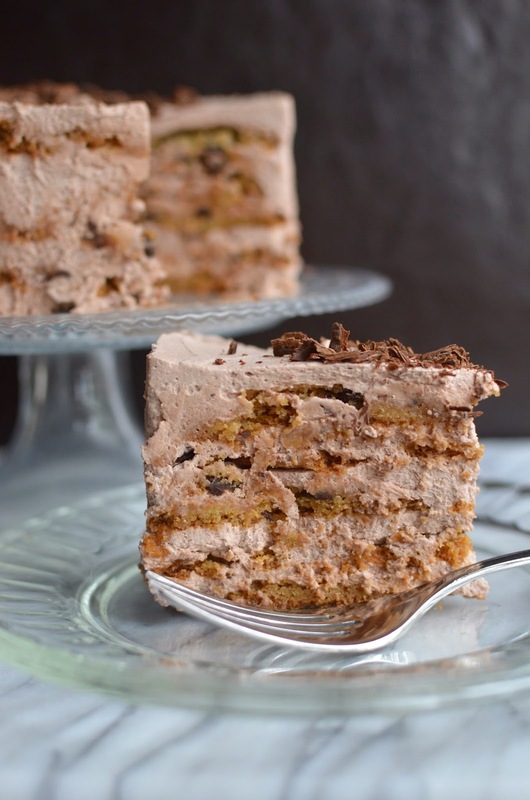 This 6-inch icebox cake of mine is a bit of a mashup between Ina Garten's mocha chocolate icebox cake and Martha Stewart's chocolate chip icebox cake. A few years ago, a friend told me how good Ina's recipe was and ever since then, I've thought about trying it. Ina uses Tate's chocolate chip cookies - those shatteringly crisp cookies are terrific (my son is a big fan) but I had a hankering to make my own and that's where Martha comes in. I rarely make thin and crisp chocolate chip cookies (thin and chewy ones, yes) but this was a nice experiment. I found the crispiness a nice change. And the handy thing about it is you can simply bake the cookies a couple of minutes less and end up with a softer, chewy cookie instead. For the icebox cake, you do want to make sure and use crispy cookies since it will do its thing and soften with the layers of cream in between it. For the creamy filling, I decided to go with cocoa-flavored whipped cream instead of mocha and I tweaked Ina's recipe by using a little less mascarpone cheese, reducing the amount of sugar, and skipping the liqueur. Since the little guy would be digging into this cake with us, I omitted the liqueur but I think it would be a safe bet to say that it'd be delicious with it. I divided the recipes I used in half to make my scaled-down version. Unless you're feeding a crowd, it may be wise because we're talking layers of chocolate chip cookies, with a rich (though deceptively light-tasting) whipped cream and mascarpone filling. I find this is the kind of cake that you put on a plate and you polish off whatever's on that plate, so a small slice may be the way to go when it comes to enjoying this. Most icebox cakes are freeform and I like that casual simplicity but I think I prefer Ina's way of making it in a cake pan. You need a springform pan, or as in my case, a 6-inch cheesecake pan (one with a removable bottom). I think it makes for a neat presentation. Plus, it's super easy and convenient to assemble that way. I think my first icebox cake gets a thumb's up. Like I said, once you take a bite, it's hard to stop eating. Funny thing...when my son tasted this, he told me "mmm, it's really good! I thought I would hate it, but it's really good!" That gave me a good laugh! I think the sound of "cheese" (i.e., mascarpone cheese) threw him off a bit but the taste won him over. I always know something is good when he asks me how much of it is left...needless to say, he wanted dibs on the last piece though he was willing to share. Let's have a little fun, shall we? In this case, let's go a little crazy with desserts! Let's start with something cold. 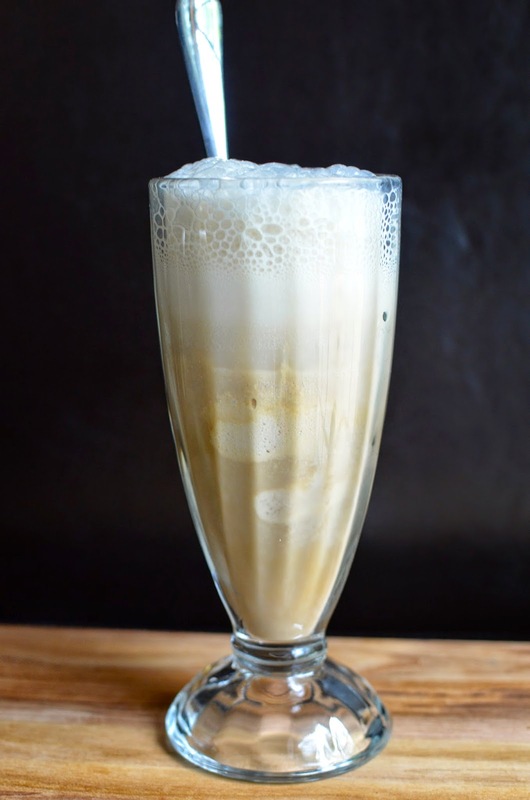 We'll make an affogato float...with coffee ice cream, a shot of espresso, some milk, and seltzer. Then, we should have something to eat so let's make a sandwich. Not just any sandwich but a grilled chocolate sandwich! Because...well, why not! And I'm telling you, this sandwich is totally delicious! I was feeling a little "crazy" so we made both these things one recent afternoon and it was so much fun! ...and topped with a touch of milk and finally, some plain seltzer. 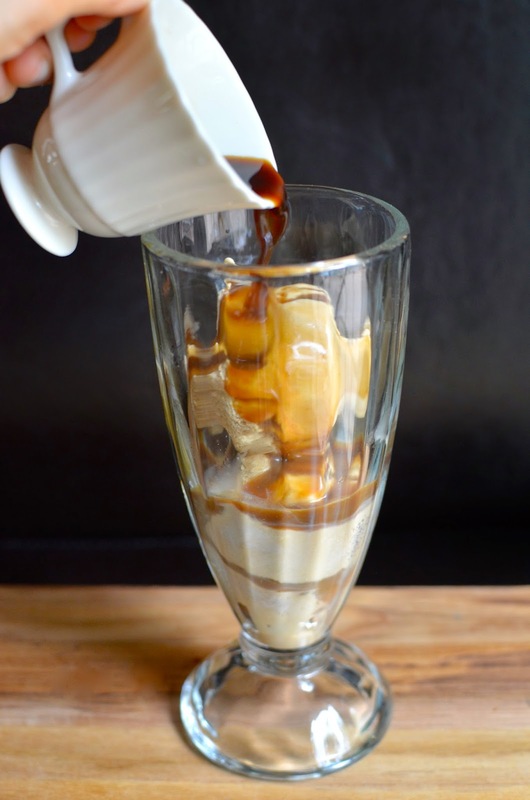 I seriously love myself an affogato so when I spotted a little recipe (more like some quick directions) for a chilled affogato float in the July/August 2014 issue of Martha Stewart Living, I had to try it. This is just totally fun and a great afternoon treat for a coffee lover. 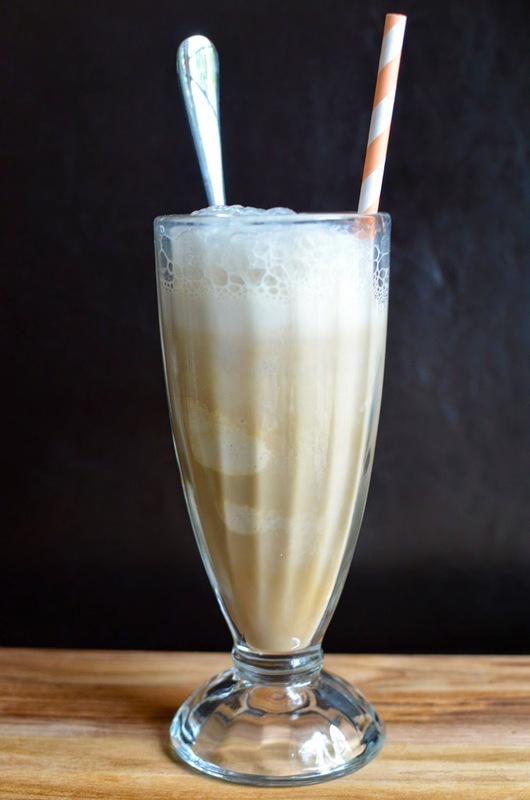 For kids, take the seltzer you're using for this recipe and make chocolate egg creams. That's what I did for my little guy. We love egg creams in our house. Grilled cheese sandwiches are great but how often do you have a grilled chocolate sandwich? This was a first for us and honestly, it turned out totally delicious! Picture crusty slices of baguette, smeared with salted butter on one side, filled with your favorite dark chocolate, and then toasted on the griddle til golden brown, crispy, and warm. 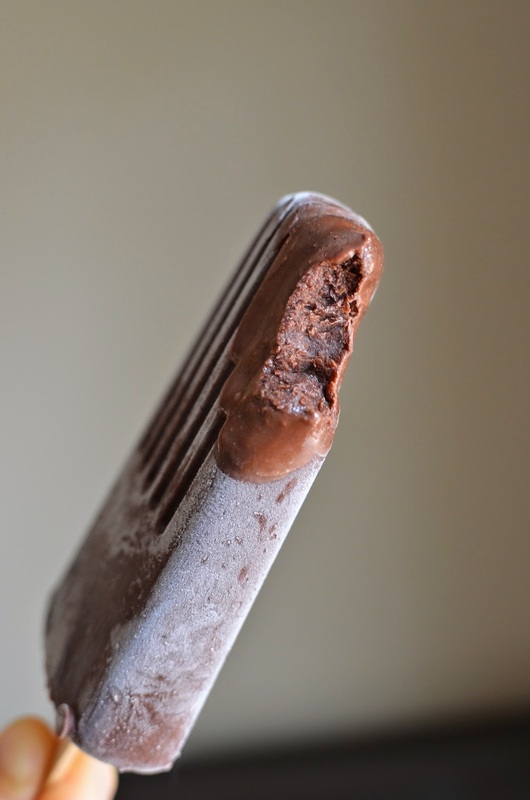 It's crunchy, chocolaty, and slightly salty in every bite...in other words, it's really good! This was one of my kitchen projects with my little guy. I've made it something of a small mission of mine to do some cooking "lessons" with him this summer. We've been making simple savory as well as sweet dishes and I'm trying to come up with ideas that are fun, do-able, and quick that he would enjoy (and love to eat). This was definitely on the fun side of things. When I told my son we would make grilled chocolate sandwiches, his reaction was: "what?" He thought his mother had possibly lost her mind and wasn't convinced by the idea. But going through the steps and tasting it, he (and the rest of us) were totally on board. Not only is it a fun idea, it's really a very tasty one! You could serve the sandwich alone as a sweet snack or round it out with some ice cream for a full-on dessert! Talk about an ice cream sandwich! This makes for a whimsical kind of unexpected dessert. Now these are my ideas of summer fun!